Fung Chi Ming’s feedback: I am not surprised that Dan Waters saw sedan chair service on Sunset Peak in the 1950s. It is evident that Sunset Peak has been a place of retreat for expatriate missionaries. Bungalows, used by them as retreats during the summer season, were built high up in the hills of Sunset Peak prior to the Pacific War. Just below the summit, there are about 20 of these quaint-looking stone bungalows, most of them still in use today. The higher part of Sunset Peak was, and still is, a long way from the motor road and as much as 2 hours of walking is needed to cover the distance. There are paths up the mountain, but these in many cases call for laborious efforts in walking and are unsuited to any form of wheeled conveyance. No doubt, the climb to Sunset Peak is quite demanding and the only way to avoid perspiring is to be carried up and down in sedan chairs. A sedan chair service was also available in Tai O, an outlying area in south-western Lantau. Alice S.K. Yau, a geography and geology student of the University of Hong Kong, went there for a week’s stay in the late 1950s in order to collect information and take photos for her B.A. thesis. 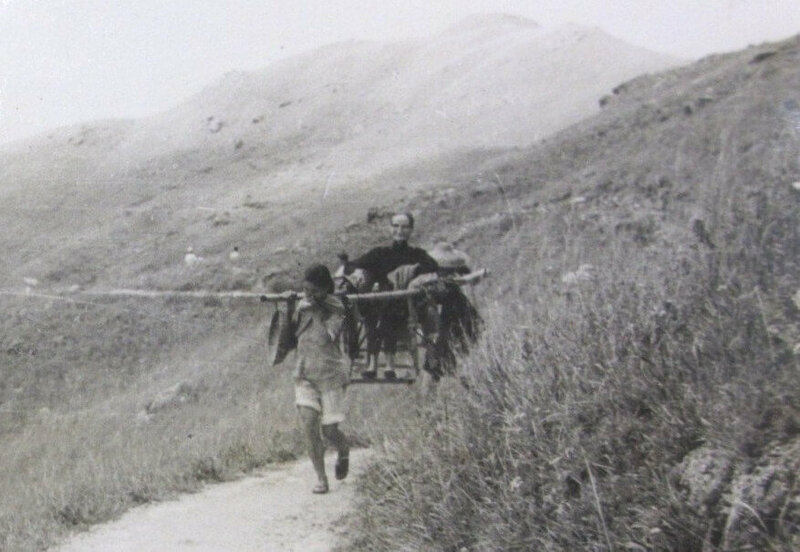 In this thesis, “A Regional Study of Tai O”, which was completed in September 1960, there is a photo showing a woman carried on a sedan chair carried by two bearers. CM Fung adds: The work of Alice Yau was unpublished. It is a hard copy. It can be read only in a room of the Special Collection, 1/F, HKU Main Library. Normally, no photocopy of the work is allowed. This article was first published on the 15th April 2014. I wonder exactly where the photo was taken. It looks a very wide footpath, more like a rough, narrow road. Dan Waters tells me, “they used to say the working life of a chair coolie was eight years.’ When you see this image it’s easy to see why. As the photo is captioned “Sedan chair service in Tai O, late 1950s’, it is likely somewhere on a foot path between Tung Chung and Tai O. From the look of it, it is likely snapped on a section approaching Tai O.